Quality Improvement-How Can We Improve? The Wood County Health Department provides breastfeeding education, support, and resources to all breastfeeding mothers regardless of income, age, or race. The Wood County Health Department has 7 professionals certified in lactation. Lactation consultants call or text all breastfeeding moms who reside in Wood County. Calls are made at 1 month, 3 months, and 6 months postpartum. Subscribe to the quarterly Wood County Breastfeeding Coalition Newsletter! 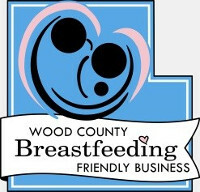 The Wood County Health Department provides information and support for Breastfeeding Friendly Businesses and Friendly Childcare. Both programs are recognition programs for implementing breastfeeding friendly policies and environments. For more information and to stay updated on the latest breastfeeding information and events going on in Wood County, visit www.woodcountybreastfeeding.org and follow the Wood County Breastfeeding Coalition on Facebook.